Treasury Secretary Timothy Geithner says he's encouraged by the efforts being made by European leaders to fix their debt crisis. NEW YORK (CNNMoney) -- Treasury Secretary Timothy Geithner said Wednesday in France that he has faith in the ability of European leaders to solve their debt crisis. Geithner has been meeting this week with leaders in Europe, expressing U.S. support for efforts to resolve the crisis that threatens to rip the eurozone and cripple the global economy. 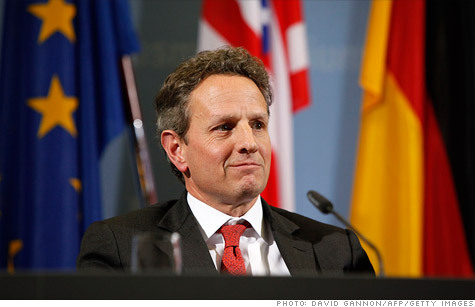 "I want to emphasize again how important it is to the United States and to countries around the world that Europe succeeds in this effort to build a stronger Europe, and I'm confident they will succeed," Geithner said. After his meeting with Baroin, Geithner sat down with French President Nicolas Sarkozy and is scheduled to see Spanish prime minister-elect Mariano Rajoy later Wednesday. The leaders of 27 European nations will hold a two-day summit starting Thursday in Brussels, Belgium. They will discuss plans for a new fiscal union that would impose more stringent accountability on the budget of individual nations. Sarkozy and German Chancellor Angela Merkel, heads of the two largest economies in the 17-nation eurozone, said Monday that their pact would involve amending or rewriting the treaties that govern the European Union to force members to manage their budgets in a more structured and coherent way. The pact is to be presented in more detail on Friday. Investors have been looking forward to the meeting to see exactly what it will entail and whether that will have any tangible impact in pulling the eurozone out of its debt crisis. European nations could be penalized by being stripped of some powers if they fail to manage their budgets, according to a confidential memo from European Commission President Herman Van Rompuy leaked Tuesday. Van Rompuy's proposals, details of which were obtained by CNN, may be even stricter than those of Merkel and Sarkozy. The five-page memo proposes that the European Commission might be given the right to strip voting rights within the European Union from some countries who have been bailed out but are still not meeting their deficit targets. The executive arm of the EU could force bailed-out countries, such as Greece, Ireland and Portugal, to comply with deficit regulations, which for the entire EU currently stand at 3% of GDP. The meeting will occur under the shadow of a recent report from the rating agency Standard & Poor's, which threatened to downgrade 15 eurozone member states. Even the AAA-rated nations France and Germany have been placed on review for possible downgrade as the debt crisis continues to worsen. Regarding two eurozone members not place on credit watch, Greece's credit rating already reflects a high risk of default and Cyprus was already under review. -- Nina Dos Santos of CNN contributed to this story. Correction: Two earlier versions incorrectly stated when Geithner made his statements.